LIJ Valley Stream critical care unit staff celebrate Beacon Award recognition. 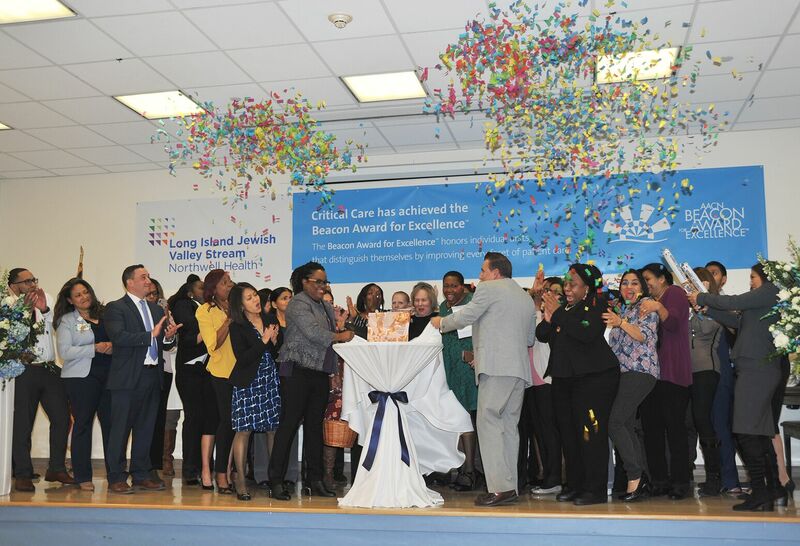 The Critical Care Unit at Long Island Jewish Valley Stream Hospital (LIJVS) has earned a bronze Beacon Award for excellence from the American Association of Critical Care Nurses (AACN). The award recognizes individual units that distinguish themselves by improving every facet of patient care and achieving optimal outcomes. The recognition culminates a four-year journey in which the critical care team worked together to consistently raise the standard of patient care at LIJVS. To be eligible for the Beacon Award, LIJVS’s critical care unit had to meet specific criteria in the areas of: leadership, staffing and staff engagement, effective communication, knowledge management, learning development, evidence-based practice and processes and outcome measurements. The unit received a multi-level peer-reviewed evaluation, followed by a comprehensive feedback report. LIJVS is currently the fourth hospital in the Northwell Health System to receive the Beacon Award. North Shore University Hospital, Cohen Children’s Medical Center and Lenox Hill Hospital have also been honored.